They certainly have a dynamic look as they arch over a kitchen sink. They’re referred to as coil-spring or spring-spout faucets. The names come from the obviously high, curved spring that serves as a spout while supporting a flexible hose within. 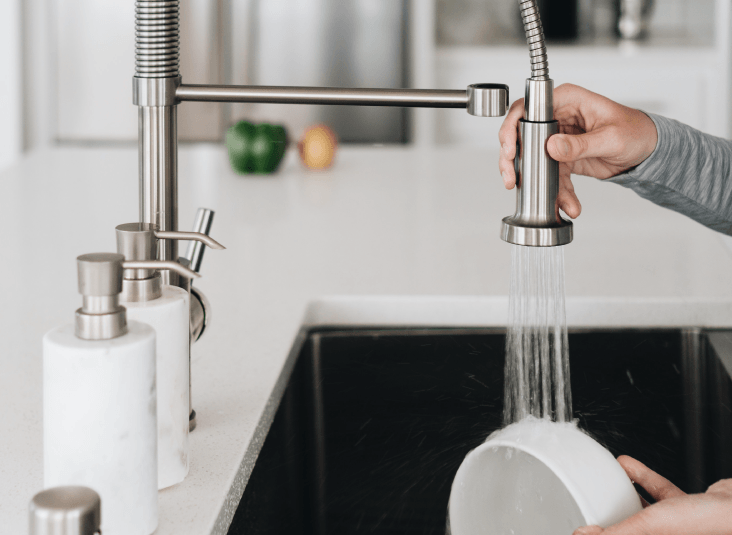 Until recently, these faucets were only seen in busy restaurant kitchens; but today you’ll find versions being sold to homeowners by most major faucet manufacturers. So, would one of these high-profile faucets be appropriate in your kitchen? Keep in mind that in the food service industry, the kitchen is expansive with plenty of space to cook and clean. And it’s the volume and pace of dirty dishware in need of immediate washing that makes a super-duty faucet a necessity. These dishes need to be rinsed of their heavy leftovers before being run through an automatic dishwasher. The high water pressure and flexible neck of a commercial-grade, spring-spout faucet accomplishes this task quickly and efficiently. The residential versions of these faucets look like the commercial ones, but they don’t have the same intense water pressure that a busy restaurant kitchen requires. And that is a good thing, or else your kitchen and you would be a splattered, wet mess with each use. On its own, this styling acts much like any other high-arc faucet, ready to handle ordinary chores within the sink. But once you unhook the spout, you are ready for extraordinary action. The swiveling spout turns and stretches and bends to let you reach pots outside of the sink proper within a full 360-degree perimeter. With some models, the hose is long enough to fill a bucket on the floor and flexible enough to spray in any conceivable direction. A push of a button changes the normal stream to a spray that is firm, yet gentle enough to rinse vegetables. Every manufacturer has their own stamp of originality on their models. Water pressure varies, but most provide a bit more force than standard faucets. Some have magnet connections at the spout while others hook in place. Hoses extend to varying lengths, and some models have a second, stationary faucet as well. The spring-spout faucet is definitely an attention-getter and offers the most flexibility of any pull-down style faucet. If you like the industrial appeal of its design and have the space and the need for its amenities, your kitchen might be the perfect place for this workhorse.